Fabrics | cut it out, stitch it up! Happy New Year and yes I’m still knitting the jumper. The end is near, I have another 5 or 6cm to do on the sleeves and then it’s the roll neck and sewing up. I took the advice I was given and knitted the two sleeves at the same time. One set of needles, two balls of wool. Half way up the sleeves I swapped to slightly longer needles to cope with the width. 40cm instead of the 35cm I had been using. 5cm does make a bit of difference and they were only £2 to buy. I have found that this jumper has taken over my life. I feel like I should be knitting now and not typing a post…. The sleeves have taken longer than anticipated, manly due to evenings out in the run up to Christmas and no knitting was done during Christmas week. Knitting hasn’t left much time for sewing but I did manage to run up a Sewaholic Renfrew in November. I’ve made a few of these now but this time I wanted to alter the cowl neck line. I wanted more of a roll neck look. The neck line on the original pattern is quite wide and deep so I raised the neck line on both the centre front and back and extended the shoulder up closer to the neck. I had some polyester stretch fabric which I used for a toile, it took me a couple of tries to get it fitting how I wanted it to. The collar piece isn’t quite a straight tube. The edge sewn to the neckline has a slight curve, just like the original pattern and the centre back seam slants outwards so the top width is slightly wider than the bottom width. I really love the fabric and it was such a bargain. It is a wool mix, I bought it in Abakhan so I don’t know the exact fibre composition but I’m supposing it is mixed with polyester and I think there maybe some elastane in it. 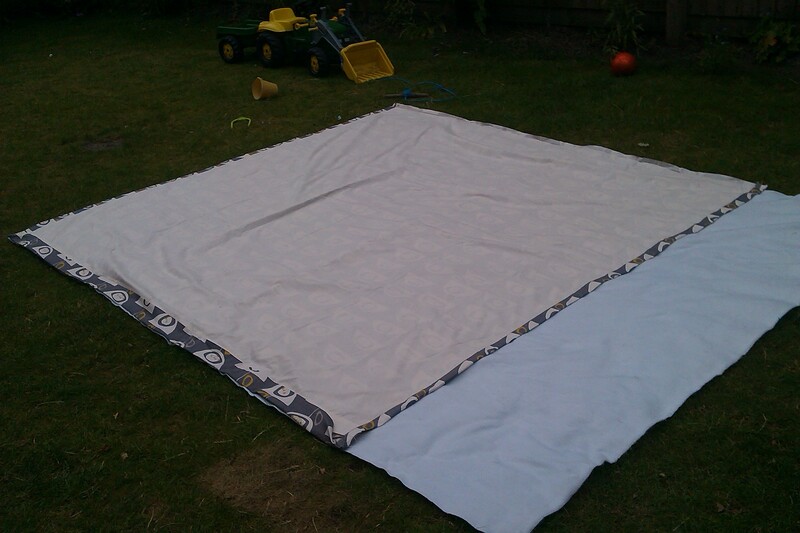 The piece I bought measured 2.20mts at 150wide and cost only £7.50 when weighed. It is a light weight rib construction, maybe referred to as a ‘sweater knit’ and it is seriously warm. When doing some Christmas shopping I came across this thimble shaped desk tidy in John Lewis, I just had to have one! So hopefully the jumper will be finished in the next few weeks and I can get back to making myself some new clothes. I could do with some inspiration. I popped into John Lewis last week and was seriously disappointed with the fabric offering, in the past I’ve picked up some really bargains in the sales. I was hoping for some interesting prints but there was nothing. Every other area in the shop was busy but the fabric and yarn department was dead. The latest Boden catalogue has just come through the door and I really like the look of the printed trousers. The fabric is cotton with 3% elastane, I remember trying to find similar printed fabric in a trouser weight last year but didn’t have much luck so if anybody knows a source I’d be grateful. I have the pattern I made for these trousers which would be perfect. I also like the printed shirts and haven’t made myself a shirt for a while so maybe that’s where I should start. This year is really speeding along and summer is practically here. I have so much I’d like to make but not enough time. When I should be working I get out my notepad and scribble down sewing plans week by week. 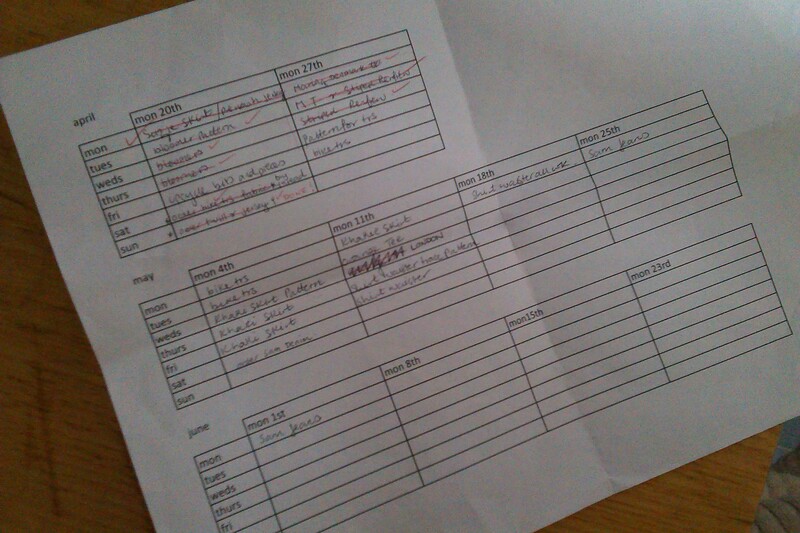 I’ve even done a typed template where I can get the satisfaction of crossing out what I’ve done in red pen. I started with a couple of easy makes. 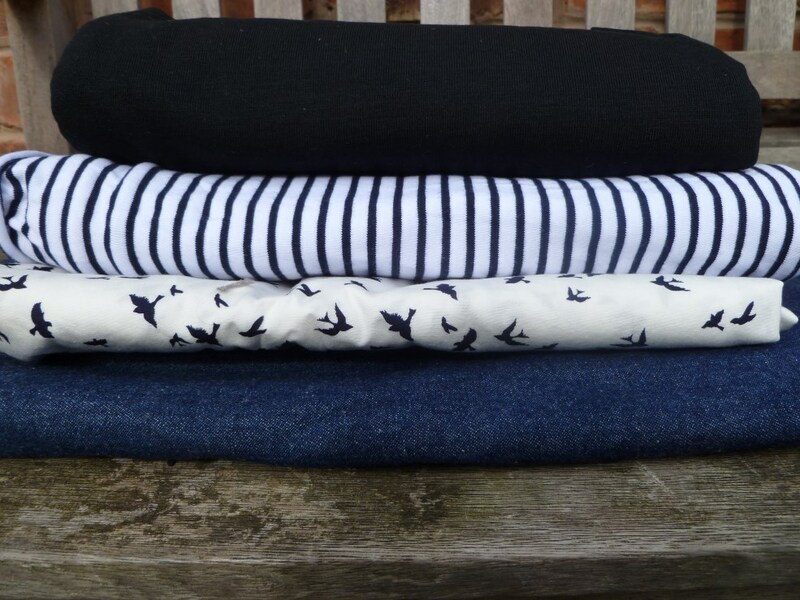 A navy Maria of Denmark Kimono tee and a Sewaholic Renfrew. 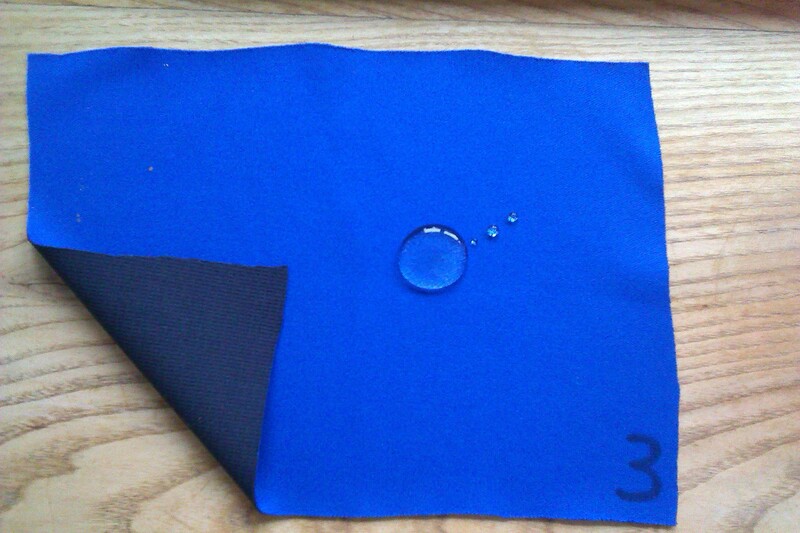 The fabric for the tee was the same cotton / lycra single jersey remnant from Abakhan that I’d used for the bike bloomers. It’s a lovely weight with a slight brushed finish. This piece of fabric only cost £1.50.This is the 4th kimono tee I’ve made. My first was a grey marl one which was my first real attempt at sewing with knits properly. It still looks good after nearly 18 months and gets a lot of wear. That fabric was also a remnant from Abakhan. The second two haven’t been quite as good. The fabric was a single jersey from Calico Laine which after a few washes soon went limp, I still wear them occasionally but feel they are a little bit scruffy. 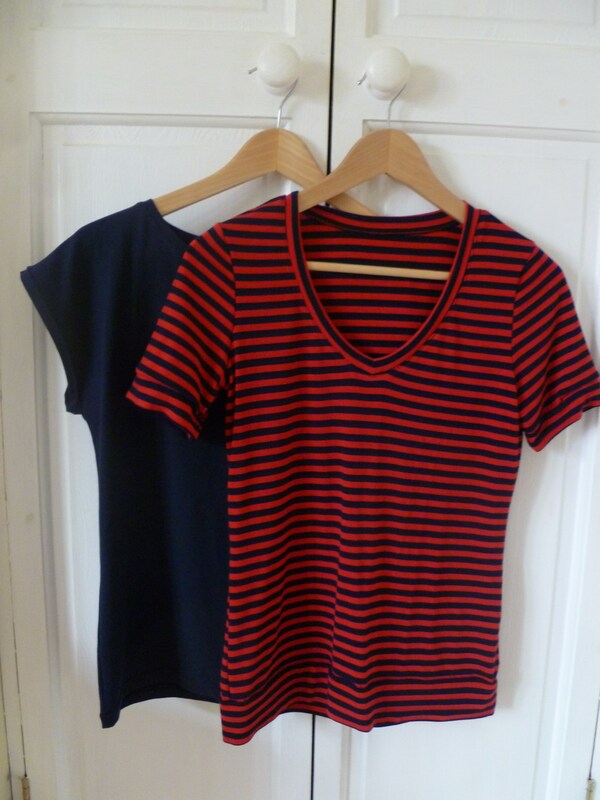 The single jersey for the Renfrew is a viscose / lycra red and navy stripe from John Lewis, on sale reduced from £16 to £8 a metre. I used the V neck when I made a pyjama top last summer and trimmed with lace but this is the first time I’ve added the neck band to the V neck. I knew it would be a bit of a challenge and nearly went for the easy round neck version. I liked the effect of the stripes mitring at the centre but getting the shape of the V was a right faff. I stabilised the V with a small piece of stretch iron on interfacing then tacked and re-tacked numerous time until it looked ok. I got there in the end. The front V on the Renfrew was a bit of a challenge….. 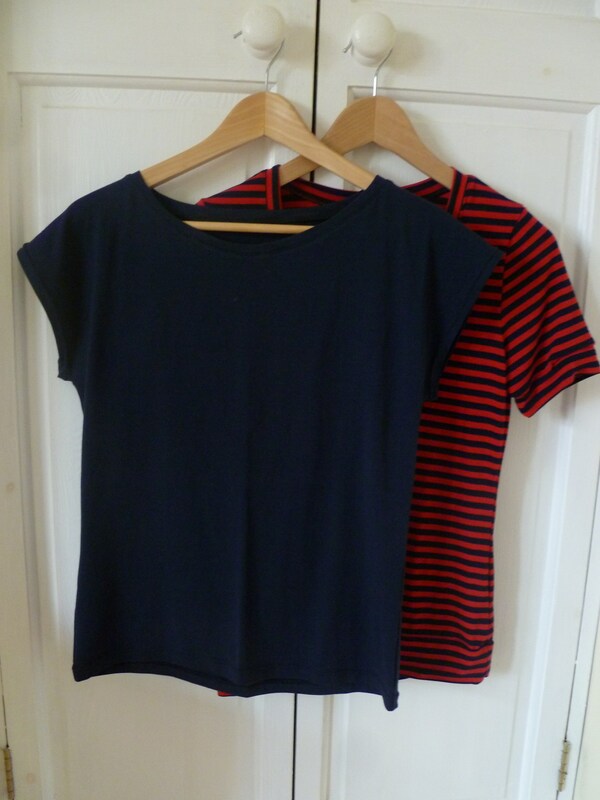 I sewed these two tops up together using the 4 thread overlocker. On the Kimono tee I got out the twin needle for the hems and surprisingly worked out ok, no tension issues for once. I’m trying to be realistic about what I can get done and not plan too much in. I have that lovely Hemingway Designs fabric to use, out of the 3 pieces I have I’m going to use the red print and make a shirtwaister dress. 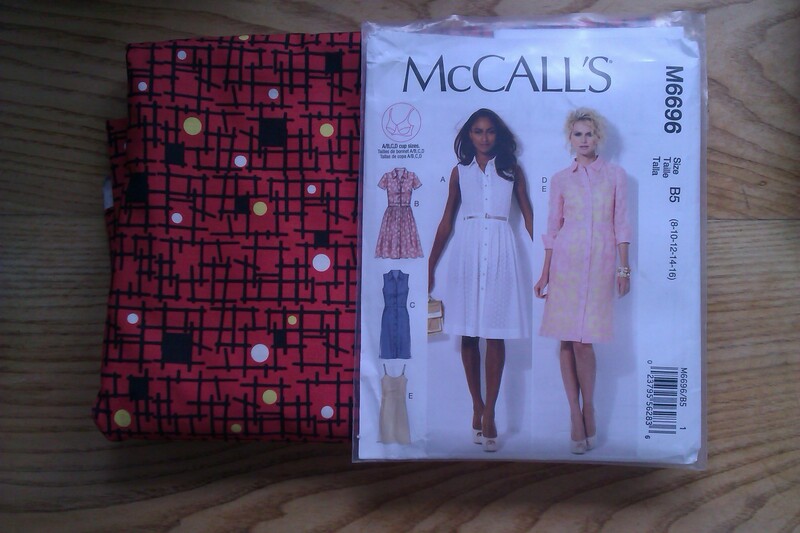 I googled for a pattern and the blogosphere came back with McCall’s M6696. I saw some great dresses so didn’t bother to look any further. 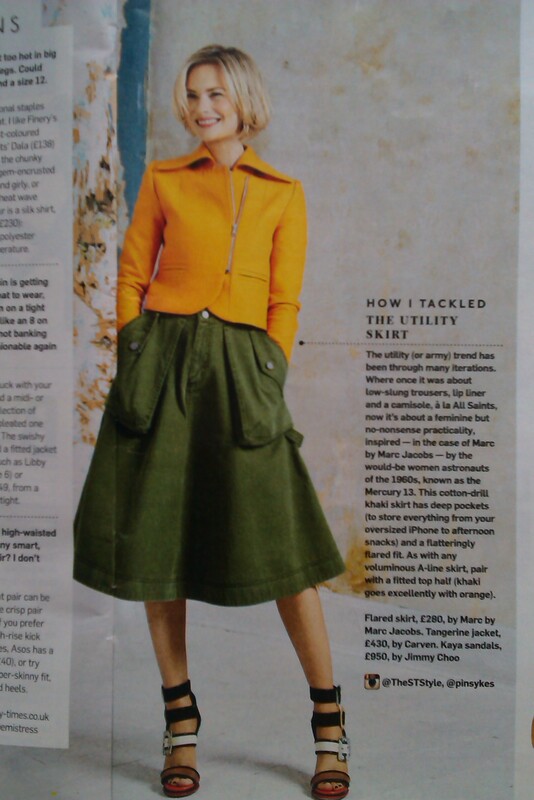 I was also inspired by this outfit in the Sunday Times Style mag a few weeks back. I just love that Marc Jacobs skirt. I started looking on line for some cotton twill in the right colour green. I could find forest, bottle, moss, khaki but none looked right so I bought white and a packet of Dylon in olive. It could all go horribly wrong! I also picked up tangerine jersey for a top, now it’s arrived it’s not quite as vibrant as the top in the photo so it may get put to one side. What’s next on the list for sewing up is a pair of bike trousers. I’ve been inspired by these Outlier Women’s Daily Riding Pants. The idea is that they don’t look like biking specific trousers but have features such as 4 way stretch and a water resistant finish. A lot of these type of trousers are made from schoeller fabric which is really expensive and not easily available to the home sewer. This is the swatch of the soft shell fabric. When water hits the surface it doesn’t soak in, it just rolls of the face, this is due to the WR (water resistant) finish on the fabric. It’s generically know as ‘soft shell’ and I found some on UK fabrics online. I’ve ordered the fabric after getting a sample . I didn’t want to spend too much as I’m not sure how these are going to turn out. The plan is to slim down the leg on my jeans pattern – which looking at my sewing schedule I should have done by now. arggh I’m already behind! sewing schedule – I like to do the crossing out in red pen…..
Hemingway Designs & Lucienne Day Cotton Prints – Fabric Bargains To Be Had! 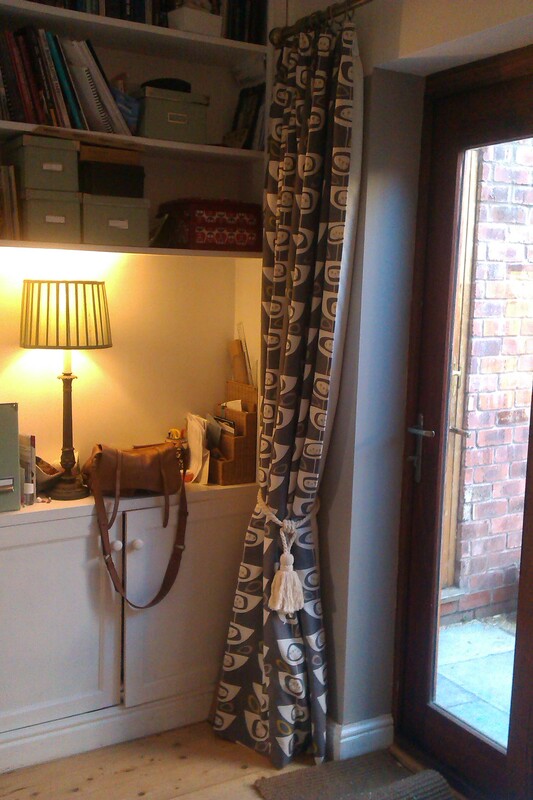 It was early last year when I first spotted the Hemingway Designs cotton fabric in John Lewis. I fell in love with the colours and retro prints. 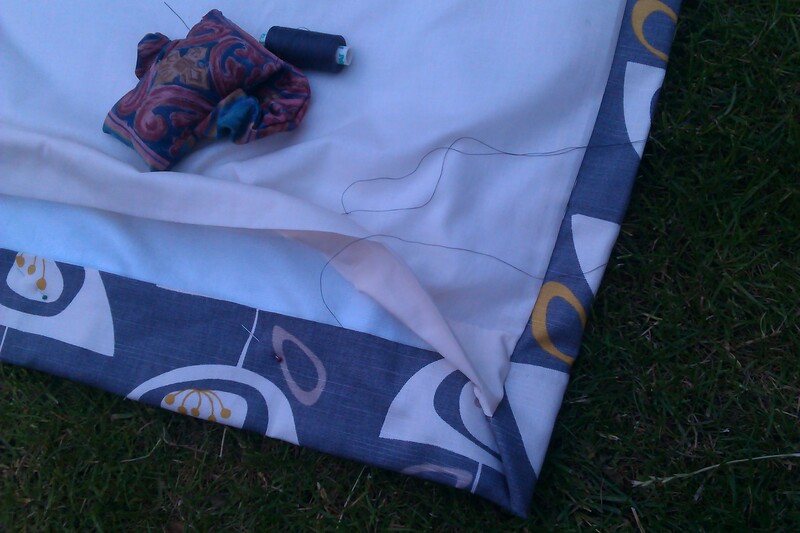 But at £20 a metre it was a lot to spend. I eventually bought some Lucienne Day print fabric which delved into the John Lewis design archives to celebrate their 150 year anniversary. This was a real treat at £22 per metre and with which I made this summer dress. 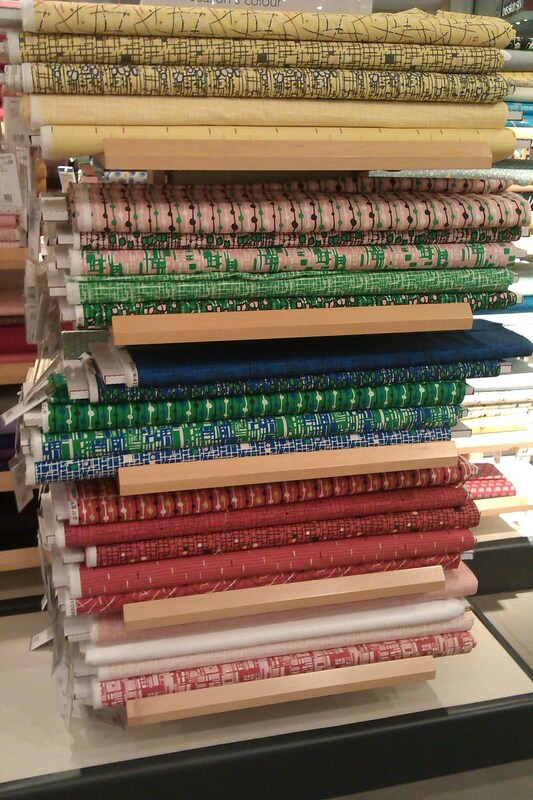 I popped into the John Lewis Cheadle branch this weekend and the fabrics are now on sale. Just before Christmas I noticed at the Trafford Centre store, the Hemingway Designs had been reduced to £10 and they are now reduced again to £5 per metre. 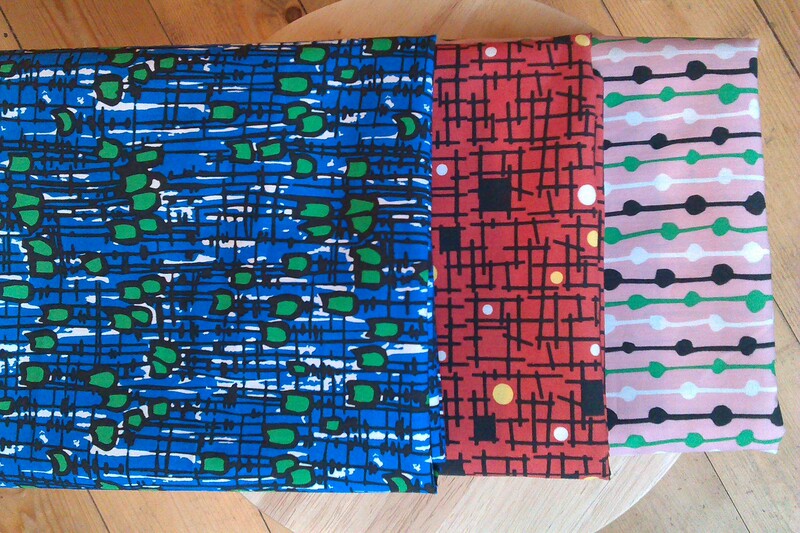 The Lucienne Day fabrics were £5.50 per metre. I just had to buy some; I couldn’t let this opportunity pass! 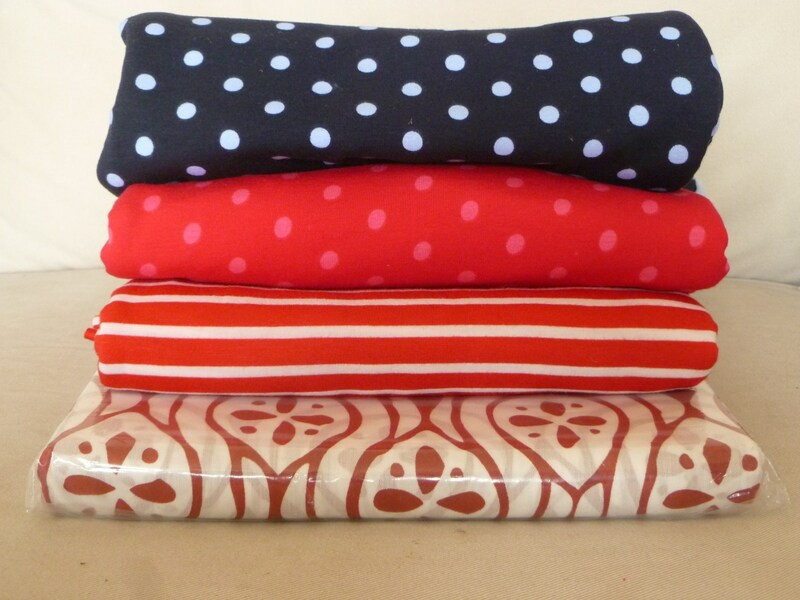 Hemingway Design Cotton Prints, £5 per metre Whoo Hoo! 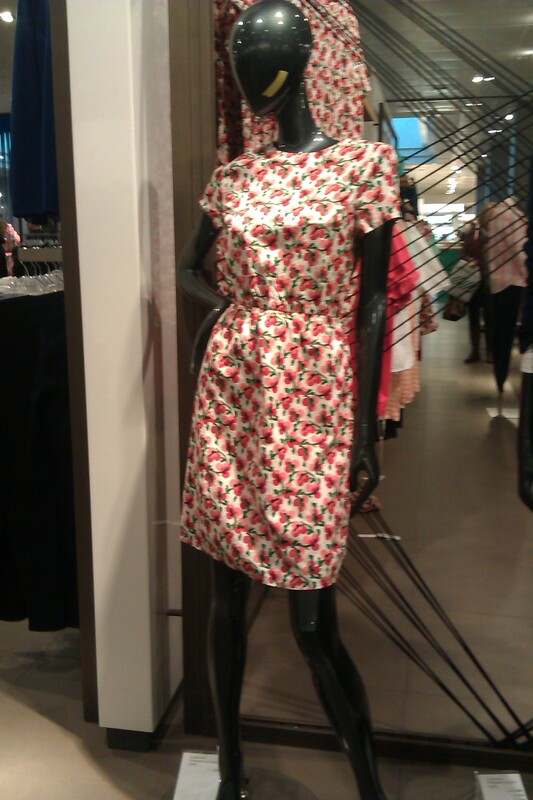 If Retro prints are your thing and you live near a John Lewis store pop in and add to your stash! I am trying to focus my mind on what items of clothing I need to sew for this coming autumn and winter. I’ve been fabric shopping and have a bit of a plan. Denim fabric, £8.99 per metre from Leon’s Fabrics in Chorlton. 100% cotton with no stretch. This is to make an A line skirt with an inverted centre front pleat. It is to replace a Boden skirt that has nearly come to the end of its life. I’ve had it for 5 years and it is beginning to look shabby with a hole at the top of the pleat, ok for home but not for work anymore. It’s going to be a self draft pattern which I need to pull my finger out and do. Bird fabric, £5.99 per metre is also from Leon’s Fabrics. Bright white with a small dark navy bird print. It’s a quilting cotton weight which I think is 100% cotton. I’m going to make a shirt based on Burdastyle 7136. After making two shirts earlier this year it’s taken a while to even think about making another one but at least there’s no matching of checks. 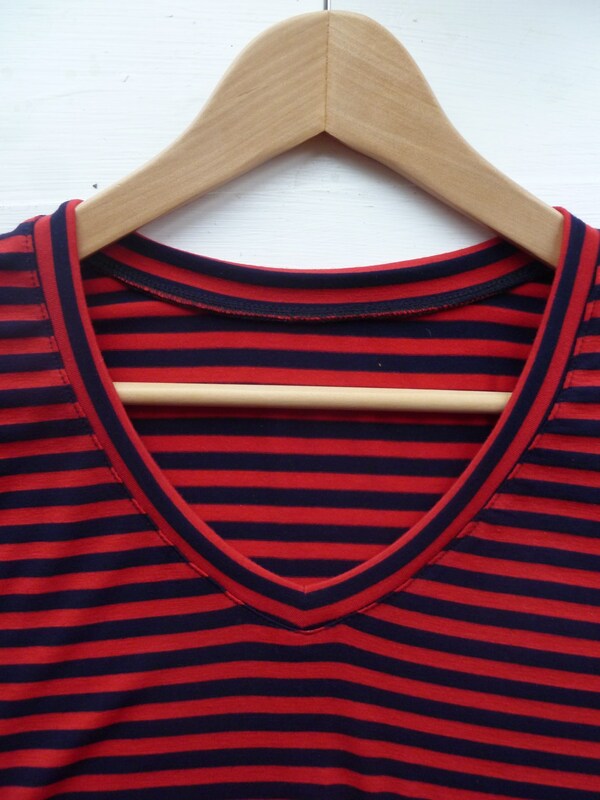 The striped jersey is going to be a Coco top from Tilly & the Buttons. I spent a long time searching for Breton stripe yarn dyed fabric (stripes knitted in rather than printed) and kept coming across Dragonfly Fabrics which Handmade Jane used when she made her dress version of the Coco but at £19.50 per metre I kept holding off. When Jane had a 10% discount code earlier in the summer I went for it. Considering I was so keen to get this fabric I’m surprised how long it’s taking me to get around to it. I thought I would have jumped on it when the fabric arrived but instead the pattern and fabric have been sitting in a bag for a couple of months. The overlocker is still out for fixing so this can be its first knit project when it comes home. The black wool jersey comes from Myfabrics.co.uk. It was an impulse buy; I came across it when I was looking for cotton single jersey for the pyjama top. I was attracted by the sale price of £4 per metre so I ordered 1.5mts with plans to make a cowl neck long sleeve Renfrew. I think it’s going to need hand washing so I’ll need to take care to keep it looking its best. I haven’t done any knitting for a while and to complete my range of hand knitted socks I need a darkish plain pair. I love a self-patterning sock but sometimes you need a more sober pair to wear with trousers. I’ve chosen a grey so they will go with both navy and back trousers but will add a pop of hidden red at the cuff, heel and toe. I’ll knit the same pattern as the ‘Hermione everyday socks’ using a short row heel. I know, I don’t really push myself by trying any fancy patterns. I’ve bought a red 20gm mini skein and 50gm for the main sock. I figured that when I usually knit myself socks from a 100gm ball I must have ¼ to 1/3 left over so 70gm overall should do it. I could be skimping it here…. What I think I need to do is split the balls equally in half and knit toe up…. You can’t skimp on foot length but a shorter leg length than usual isn’t a problem. I’ve never knitted toe up so could be time to learn. The yarn was from Five Moons. I found them when I googled ‘mini skein’. I just loved their range of plains and the colour descriptions. 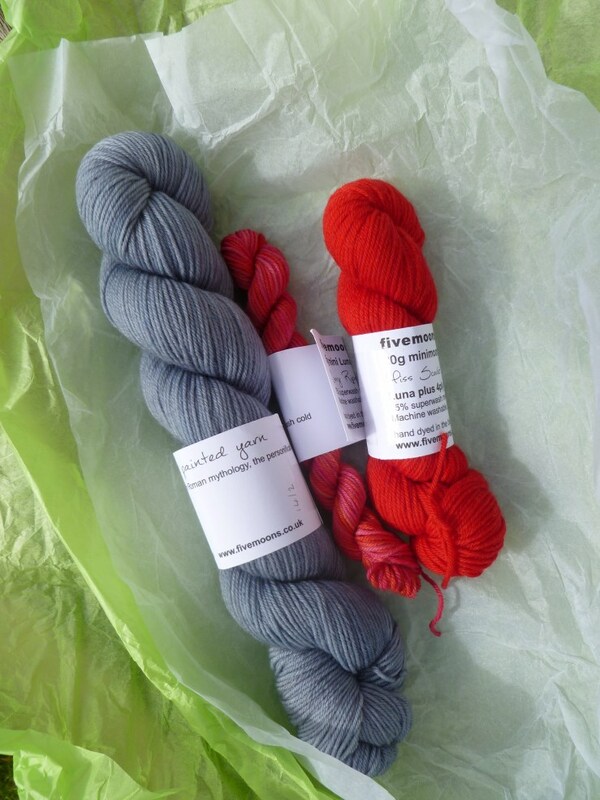 When it arrived – super speedy next day – I received a bonus 5gm skein in pinky red. Sock yarn from Five Moons. It just looked so beautiful when I unwrapped the package! I haven’t made a pair of trousers for donkey’s years and I’ve never tried to sew a fly front zip so I’ve bought Simplicity pattern S1696 Amazing Fit. 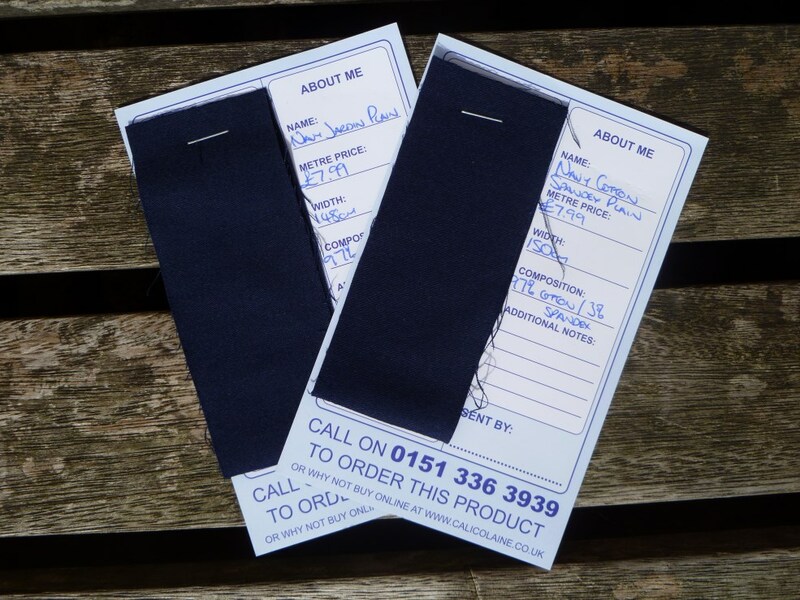 I’ve ordered some swatches of navy stretch cotton from Calico Laine. The trouser is a style that I know suits me so I hope I can get to grips with them and achieve a good looking well-fitting pair of trousers. I think all of the above will keep my busy through to November, I also have plans for a long sleeve Lady Skater, fabric yet undecided. 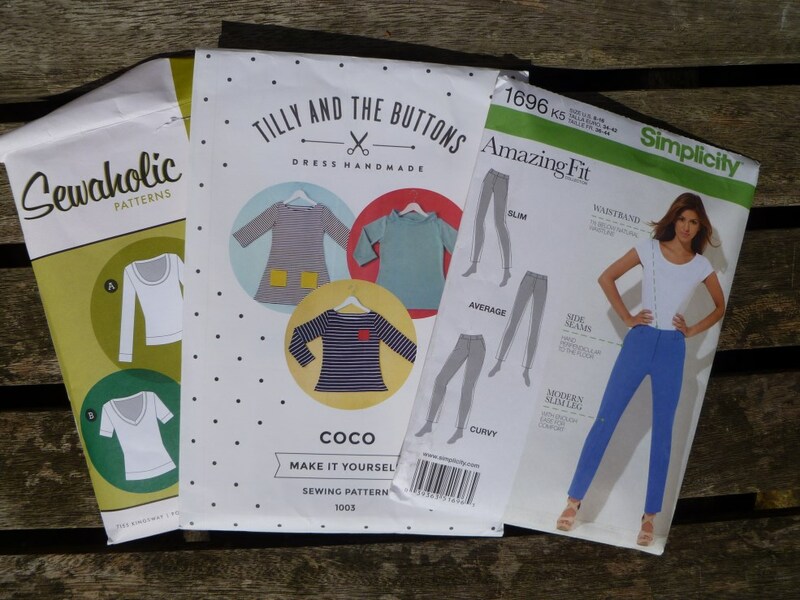 I need to actually get started……..
Any autumn sewing plans on the go?